In 2008, Ottawa County Parks acquired a 122-acre golf course known as the Holland Country Club (Property), located along the Macatawa River and Noordeloos Creek. This Property was identified in the Macatawa Watershed Implementation Plan as a key parcel for acquisition and restoration. The goal of the restoration was to reduce non-point source pollutant loading to Lake Macatawa, which is directly connected to Lake Michigan. The plan identified restoration of the onsite wetlands and stabilization of the stream banks as the two most critical items for this Property. In 2009, Niswander Environmental coordinated a private and public partnership that allowed for a local business to create wetland mitigation on the Property. Niswander Environmental provided design/build mitigation for creation of 20 acres of wetland restoration. Niswander Environmental also assisted the County in obtaining a $750,000 Great Lakes Restoration Initiative Grant. 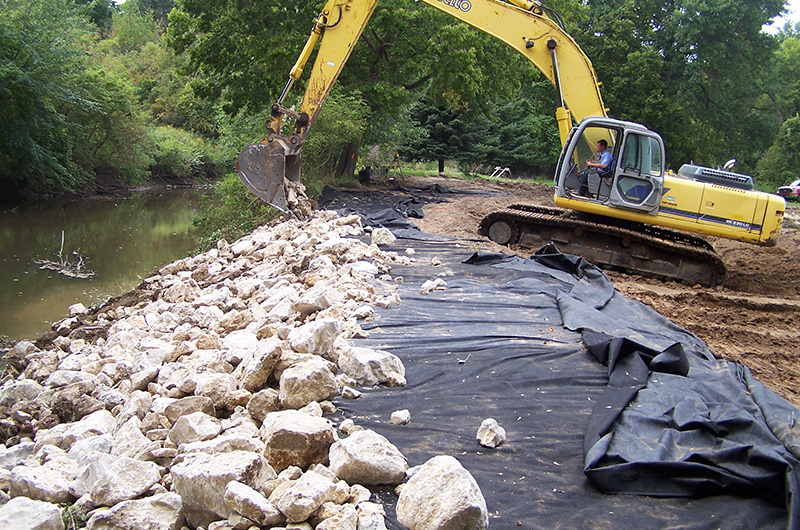 Niswander Environmental was awarded the design contract to stabilize 4,300 feet of stream bank, restore the riverine wetland habitat, and increase the floodplain storage capacity. The combined restoration plans included converting 62 acres of golf course turf grass that was located within the 100 year floodplain to wetland, and restoring approximately 4,300 feet of the Macatawa River and Noordeloos Creek with a combination of in-stream Natural Channel Design and bioengineered streambank stabilization. Of the 62 acres of wetland restoration, 20 acres were restored through the private project in 2010, while the remainder was restored by Niswander Environmental and Ottawa County Parks in 2011 and 2012 through the grant. This public and highly visible restoration project has restored native plant communities, and provides excellent opportunities for watershed education and a variety of outdoor recreation activities. Niswander Environmental was solely responsible for the delineation and permitting, the wetland and stream design, and all contract documents. Furthermore, Niswander Environmental was the general contractor for the mitigation phase and construction oversight manager for the second phase of restoration. Niswander Environmental seeded the entire mitigation area and planted over 8,000 bare-root trees into the wetland basin in the fall of 2010. Niswander Environmental is also providing management and mitigation monitoring services for a period of 10 years that began in 2011.